Change is good in life it is also good it the Gym. Being fit is a life style change with the right diet, and training you can reach your gold in no time. I'm a real up beat person I love to help other's get what they need and want. Fit for Life is what I want to give you. 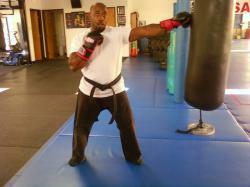 I've been in Martial Art for 6years in i have a Diploma from Penn Foster Career School for fitness and nutrition.I'm also a Martial Art Teacher.